Bob Derrenbacker graduated from Colgate University in 1959. He joined Northwestern Mutual in 1960 and began his insurance career in Syracuse, NY. Since then, Bob has worked with families, small business owners, physicians, and other professionals in regards to their insurance programs. Several of his clients needed assistance with their employee benefit programs so Bob began working with these clients in regards to their Group Life and Group Long Term Disability plans. He also assisted them with their retirement plans, on both a qualified and non-qualified basis. Peter Derrenbacker joined his father at Northwestern Mutual after graduating from Colgate University in 1989. Peter quickly became interested in employee benefits and began assisting Bob with many of his existing client relationships. 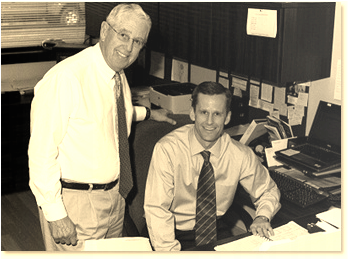 Since then, Peter and Bob have grown their practice to over 100 local businesses ranging in size from five employees to five hundred. No matter the size, Bob and Peter approach each business with the same dedication to high quality products and exceptional service. In order to ensure that all DGBS clients, existing and new, receive the personal, attentive and dedicated service that comes standard with DGBS, a well-qualified team of specialists were hired to help Bob and Peter run their company. No matter who you deal with at DGBS, you are certain to receive the boutique experience that sets DGBS apart. We're local. We're professional. We're here for our clients.